Real Estate News and information for Clearwater Beach, St. Petersburg, St. Pete Beach, Treasure Island, Madeira Beach and Gulf Beaches of Tampa Bay. Blog by Kohan & Associates. Some people believe the myth that the real estate market grinds to a halt at the end of the year. However, the holiday season makes an excellent time to buy or sell your home. Those who are taking time away from photographing Susie dance with sugarplums or whipping up grandma's famous mint cookie recipe are serious about locating a new residence. They are generally laser-focused, ready and willing to buy. There can also be less competition if there are fewer homes for buyers to choose from in December. During the holidays we tend to decorate, bringing out the best in a home. Ideally, listings will show beautifully decked out in wreaths, bows, lights and smelling of a winter scent of pine. Holiday time may provide an emotional connection when buyers feel attached and might be willing to pay the full asking price. Initially, you might think people have less time at the holidays to look at homes because they are too busy. Actually though many have less demanding schedules due to time off between Christmas and New Year's. Some people need to buy and only have this short period to find a new home before the new year. This would be an opportune time to capture employees who will begin a new job at the beginning of the year. Kohan and Associates would love to list your home for the holidays. Give us a call to discuss today! Still living in the room downstairs at Mom's house? Say goodbye and run to your nearest real estate agent's office. Join the rising number of Americans who became homeowners in January, February and March this year. The rate of homeownership according to the Census Department was higher than a year ago, 64.2%. The number of renters has fallen for the past year or so. It appears to be a trend according to chief economist for Veritas Urbis Economics, Ralph McLaughlin. Evidence from real estate agents prove that as buyers are turning out in force, homes are "flying off the market". Pick up that rotary phone on the wall and dial us up (727) 565-1658. We will help you get out of the basement! 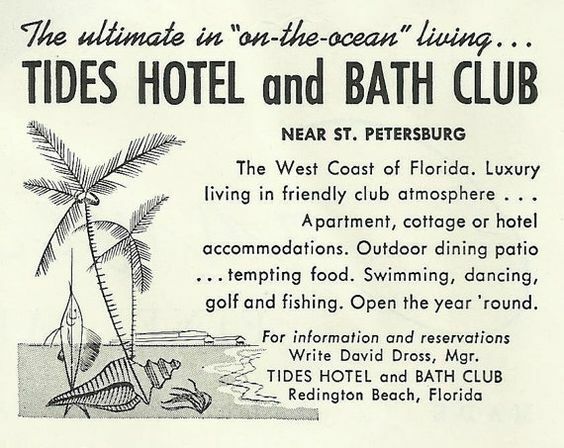 On new Year's Eve 1936 The Tides Hotel and Bath Club officially opened. It was a group of buildings including the main hotel, patio apartments, a motor inn and cottages. The Bath Club was in the center and had two dining rooms, a ballroom, dinner theater and two swimming pools. With its creaky wood floors, posh oriental rugs and eloquent ambiance, it was the place to see and be seen. Pinellas County's high society made it their chosen recreation area for weddings, art exhibits, fashion shows and special events. Time could be spent swimming, honeymooning, playing cards, eating lunch or cutting a rug on the parquet floors of the Four Seasons Room. The impeccable service drew famous visitors like Alfred Hitchcock, Marilyn Monroe and Joe DiMaggio. Thousands of members through the years spent time at The Tides. Although popular, the hotel became old and rundown. The 14 acres of beachfront land were soon worth more than the aged bath house and hotel so were sold to make way for a new development. In 1996 the old Tides was demolished with the new Tides completed in 2000. Today, the Tides Beach Club consists of 6 condo buildings, 214 units, 3 swimming pools and sprawling sand beach along North Redington. The Tides roll out and the tides roll in. For information on the beautiful complex or any other properties, feel free to contact Kohan & Associates at www.Suncoasthome.com. Deciding Between Renting and Owning? Compare the cost of Renting vs. Owning a Home in Every State in 2017 to determine the most affordable option. According to GO Banking Rates, it has traditionally been financially wiser to own a home rather than renting one. But as the demand increases and the supply decreases, the price of homes has been rising across the country, per real estate marketplace Zillow. So is it better to rent or own? In a survey comparing costs of renting versus owning, a number of places were found where it is more expensive to own than rent. This was the case in 11 of the 50 states, including a few states where the price difference is nominal. The study looked at the estimated rent prices for all homes listed on Zillow. Additionally the estimated monthly mortgage to own a home in each state was calculated, based on the median list price of homes listed on Zillow, a 20% down payment and a 30 year fixed rate loan. The monthly rent in Florida was determined to be $1,543 on average with a monthly mortgage average of $1376. 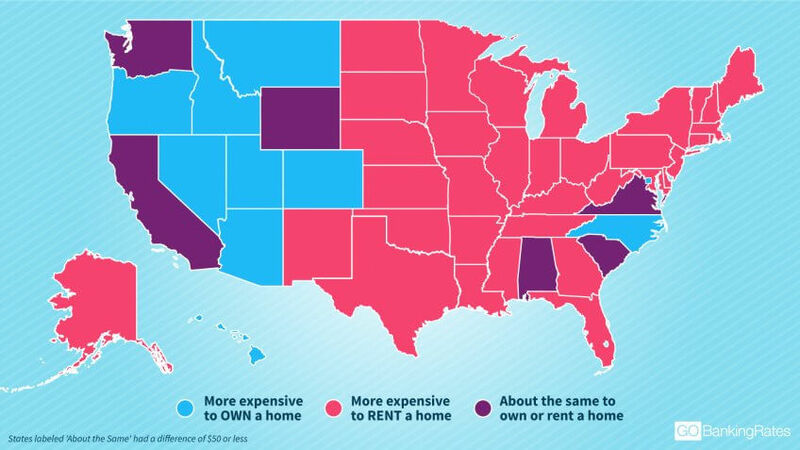 One could argue based on these numbers that it is better to buy than rent in the Sunshine State. Home prices have been rising in Florida so if you are considering making your move, there is no better time than the present. Let Kohan & Associates help with the process. Visit our website at www.Suncoasthome.com. To read more about other states from this article, click here. Wind and water combine to form hurricanes that wreak havoc on our homes and in our community. Living near the coast makes it imperative to have proper home insurance coverage in advance and then know how to support claims following a storm. Water is typically the culprit when it comes to hurricane damage. Unfortunately though, flooding caused by surges or water often isn't covered under standard home insurance. A separate flood insurance policy needs to be purchased. If you live in a flood prone area and have a mortgage it could be a federal requirement for you to own flood insurance. Don't wait to buy until a storm is approaching as many companies require a 30 day waiting period. Coastal homes often carry a hurricane deductible on the insurance policy. Other deductibles have a set dollar amount but hurricane deductibles are a percentage of the home's value. Take a $300K dollar home for example. If it has a 5% deductible the homeowner must pay $15,000 before the policy will pay anything. This is applicable when a home is destroyed or damaged by a hurricane. Call your insurance agent to determine if you have a hurricane deductible. Remember that recovery takes time following the devastating losses associated with hurricanes. If you are prepared and plan in advance, putting your home back together will go so much smoother following the storm. "Projects that take a home significantly beyond community norms are often not worth the cost when the owner sells the home," says Scott Robinson, president of the Appraisal Institute. "If the improvements don't match what's standard in a community, they'll be considered excessive." Lifestyle website CheatSheet.com highlights a few renovation mistakes that could inadvertently lower a home's resale value. 1. Letting minor damage go unfixed. To better protect your investment, touch up chipped paint, repair leaky faucets, and remove carpet stains. "Your home has to look better on the day of the open house than it's ever looked before," says Steve Clark, a real estate professional in Los Angeles. "If the back door is covered in scratch marks from the dog, you have to fix that." 2. Failing to remove trees that pose safety hazards. Though trees can be a selling point, they need to be well-maintained and planted in the right spot in order to boost the value of a home. Trees planted too close to a house could pose a fire hazard, or the tree's root systems could damage the home's foundation. A tree planted in the right spot could not only be aesthetically pleasing but also potentially lower energy bills. 3. Garage conversions. A quarter of Americans say their garage is too cluttered to fit their car inside, according to a survey by Gladiator Garage Works. So some homeowners may decide to convert the garage into a bedroom or den - but that could be a big mistake at resale. While it may earn extra square footage, these spaces tend to be poorly insulated. Also, buyers may prefer the covered parking space instead. Article posted in Realtor Mag from the National Association of Realtors. The Tampa Bay Real Estate Market is constantly growing and changing. That is why it is important to have an experienced, professional Realtor who knows current trends in the marketplace. Whether buying or selling, it is to your benefit to have an experienced consultant to guide you through your real estate transactions. Copyright 2015 - Keyvan Kohan. Simple theme. Powered by Blogger.